Seems no harder to me to get over the cement and it doesn't run the whole length of the fence. in the ground which is putting the whole development in a freeze state. Those hated cement blocks were installed a few months after "Fast Times at the Stick"
As David witnessed, a car crashed through the wooden fence in February and created a huge opening. With that, local guys were getting in and out of the park there, completely bypassing the main entrance which usually got locked up after 7PM. In essence, they had the park 24/7 for a period of time and I suspect that might have made the park popular with illegal activities after dark and some spilled into daytime. State Park erected cement blocks to stop all that the cheap way. The police came by and kicked us out yesterday at the Stick. They said they did not care that we parked there over and over for 25 years. There is no parking on the street. They said that the signs used to be there that said No Parking, but someone took them down. This is a lie. 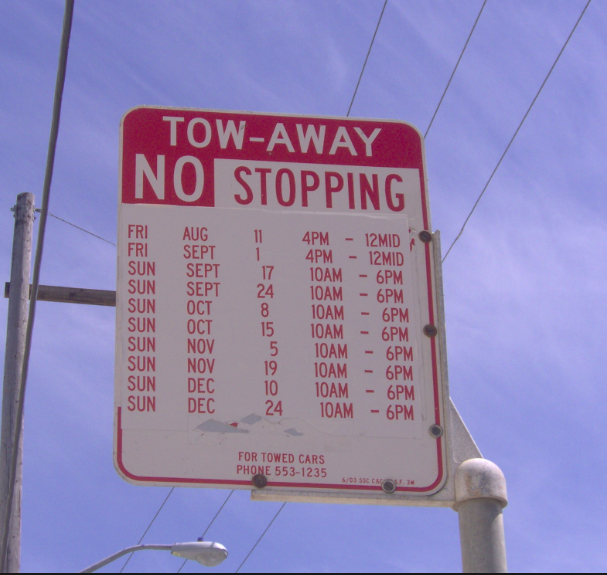 There used to be signs that said No Parking on Game Days, and they listed all the game days for the Giants/Niners. I think that if they get a call they decide to kick everyone out, no matter who it is. Ranger said it was OK the day they put the Cement blocks in. I notice they started construction again on the big mounds. At what time did they come by. The cops came by after 4:30. If they just want us to leave I wish they would just tell us the truth. I resent them telling us lies to make us leave when we all know they are making up crap. Attached picture is of the signs they used to have retricting parking by the water at the Stick. The signs listed the dates of the games at the stadium. There was no parking by the water on game days because they were charging huge bucks for parking at the stadium. Probably a young, wet behind the ears, cop..hopefully it'll pass, otherwise we'll need to park in the circle where the locals go. I don't mind as I always parked there 10 years back...how time flies. I thought we've gotten an OK from Captain Vaswani back in 2015 that we could park on the road. I think it was just a couple of rogue cops. We always parked between two No Parking Signs with an arrow. The sign near our launching area has an arrow pointing left; 1/4 mile up the road, the second sigh has an arrow pointing right. A 12 year old could tell you between these two signs, it is NOT no parking.